At Mobile World Congress this year, Huawei and HKT demonstrated 300 Mbps LTE-A thanks to two-carrier CA. This week, they upped the stakes with a three-carrier 450 Mbps demo. More important than the data rates demonstrated is the fact that the demo delivered these rates across two sites and two spectrum bands – and without C-RAN. As we move from 4G to 5G, the demo provides a reminder that backhaul and core innovation will be as important as RAN innovation. The last day of Huawei’s Global Analyst Summit saw the vendor hold a carrier aggregation (CA) demonstration in Hong Kong with HKT. Like most LTE-A demos, the media has picked up on the super-high data rates being delivered. The real story is bigger than data rates and bigger than the demonstration on the 23rd. Demos rarely hit the theoretical maximum data rate. This one came pretty close. Behind the scenes: three BBUs, two antennas and a lot of cabling. The demo in diagram form: three BBUs, two antennas, two spectrum bands and IP RAN. 1. Mobile World Congress. 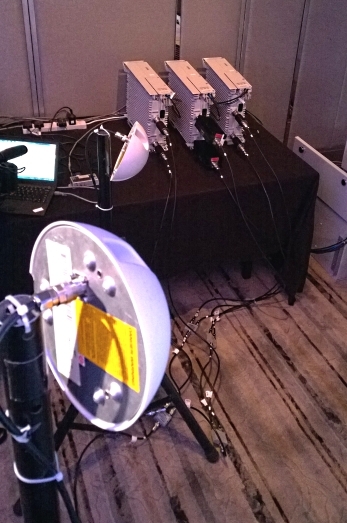 At Mobile World Congress, Huawei and HKT demonstrated 300 LTE-A via carrier aggregation of two 20 MHz FDD LTE carriers. 2. April 23rd. This week, Huawei and HKT followed up on February’s demo by extending their carrier aggregation work to three 20 MHz carriers, achieving 450 Mbps data rates. 3. Inter-band CA. In each case, the demonstration involved carriers in two different spectrum bands: 1800 MHz and 2600 MHz. 4. Inter-site CA. In each case, the demonstration involved carriers from two different sites. 5. Close but Not Pooled. For the purposes of the demo, the base station BBUs were in close proximity, but weren’t pooled. This was not a case of C-RAN. 6. Leveraging Huawei IP RAN. Given the tight timing coordination required for inter-site CA, C-RAN might be expected. 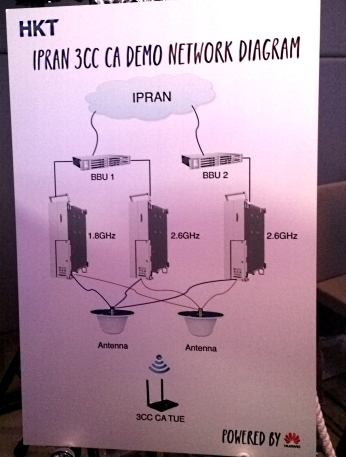 In both of the HKT demos, Huawei leveraged its IP-RAN solution (backhaul) to meet the strict latency requirements. For operators, the benefit is an ability to leverage C-RAN where it’s needed, but also address sites where it’s not wanted. 7. What’s the Story? When queried about applications enabled by three-carrier, multi-band, inter-site CA, HKT had little to say other than calling out speed being important to the busy people of Hong Kong. This is a shame. The value proposition of inter-site and inter-band CA is improved coverage and cell edge performance thanks to exploiting different frequencies and spatially diverse sites. 8. Unique Assets. HKT is in a unique position to execute on this type of exercise: the operator maintains fiber out to all of its cell sites, along with deep spectrum assets (233.6 MHz, or just under 39% of Hong Kong’s licensed spectrum available for cellular services). 9. Still 4G. While Huawei has been vocal about 4.5G as a stepping stone technology between 4G and 5G, Huawei does not count this as part of a 4.5G solution. In Huawei’s world, 4.5G starts with four-carrier CA. 10. 5G Beyond RAN. 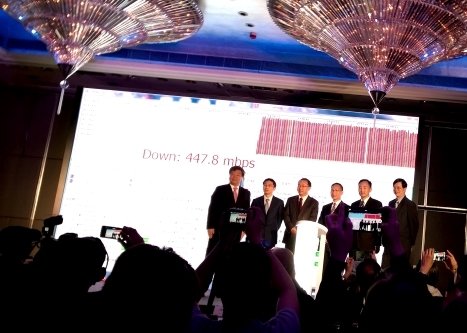 While not 5G – recall, Huawei doesn’t even count this as 4.5G – the demonstration provides a reminder that innovations beyond the RAN will be needed to deliver on the promises of future wireless evolutions. 5G investments and investigations (as well as those in the run-up to 5G) will need to be more holistic. Previous postLeveraging PNFs into VNFs: Get Your NFV Application Messaging Out Soon! Next post4.5G – What’s the Big Deal About Half a “G”?